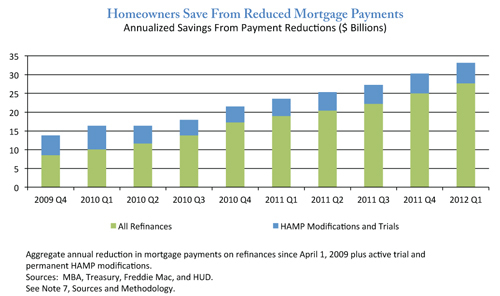 The recently released national Housing Scorecard for June 2012 pointed to both signs of promise, as well as reasons for concern when considering a loan modification. Home equity rose by 7.4% in the first quarter of 2012; sales for existing homes posted a 9.6% increase in May in a year over year comparison; completed foreclosures were down 18% year over year. The May scorecard provides an overview of the health of the housing market. After months of declines, foreclosure stats increased by 12% month over month in May; completed foreclosures increased by 7% month over month. These numbers indicate the market is still fragile overall. In addition to the foreclosure statistics, the administration also released an update on the Making Home Affordable program, under which nearly 1.2 million homeowners have received assistance. The average savings was $536 a month on their first mortgage and $159 a month on second mortgages. Also, nearly 51,000 avoided foreclosure by way of a short sale or deed-in-lieu through the HAFA program. Home prices have been stabilizing because of low inventory, and rents are skyrocketing as renters flood the market. While a combination of the foreclosure crises and the poor economic conditions, along with high unemployment in Los Angeles, have created a steady rise in rents for the past few years, rental prices have now increased at an even faster rate. Los Angeles has always had a high transient population, but now with an increased rental pool and continued slow production of new rental stock inventory, it is getting even more constrained. The ultimate effect of this supply and demand curve means higher rents. There are many in this pool of renters that could become purchasers of homes, but they have suffered negative effects on their credit because of a foreclosure or short sale. In addition to not being able to purchase, this also puts them in a position to pay a higher rent because of the increased risk associated with bad credit. Production in smaller apartment complexes has picked up over the last 6 to 9 months. Also, investment in units for Northeast Los Angeles is on the rise. The rent increase is a positive sign for the overall housing market and values. Though, many renters are not happy with this trend. If you are a current homeowner and are in distress, consider a short sale before allowing the property to be foreclosed on. The effect on your credit is significantly reduced, and with today’s guidelines, you can purchase a home again within two years. Contact me if you would like to discuss your options. It's not an uncommon story since the real estate market took a tumble a few years ago: A homeowner, on their second mortgage, owing a lot more than the house is actually worth. Unfortunately, over 11 million residential properties in the US are having the same problem - they are "underwater." The extreme loss of equity affecting homeowners and their loan to value ratio has some calling for the government to take action and reduce the number of underwater homes. For some, a short sale is a good option - but it's not for everyone. Lawmakers are now calling for giants Fannie Mae and Freddi Mac, which owns or guarantees 56% of all US mortgages, to reduce the amount underwater borrowers owe, a process called principle reduction. The idea is that principle reduction would help by giving borrowers more money overall, making it easier to sell their home (not through a short sale or foreclosure), and have the freedom to move closer to work and other job opportunities. This could then help drive economic activity, reduce unemployment, and help the overall housing market. Some disagree that the government should step in and help underwater homeowners - citing bad decision-making in buying a home they couldn't afford in the first place. Ed DeMarco, acting director of the Federal Housing Finance Agency, says it would cost taxpayers $100 billion, adding that solving unemployment issues is not a responsibility of the FHFA. Regardless of whether or not the government should help and how, the reality is that millions of homeowners are still at risk of foreclosure. Read more about it from MarketWatch.